Prentiss Riddle: Austin: FEMA concentration camp at Mueller? FEMA concentration camp at Mueller? In the era of extraordinary rendition, Guantanamo and even more secretive overseas prisons, I'd be prepared to believe almost anything, but it's time for the conspiracy theorists to update their lists. 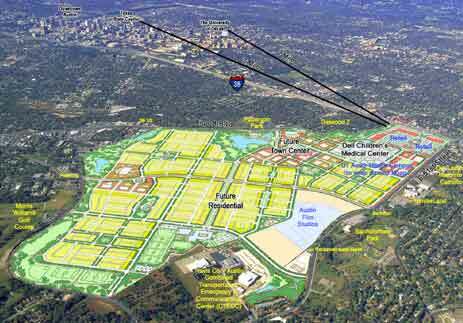 For example, here in Austin the old Mueller airport was shut down in 1999 and is in the process of being redeveloped as a neighborhood. There's no longer anyplace to hide at Mueller, if there ever really was. It's clear that if there were large-scale prison facilities in the old hangars, then current hangar occupants Austin Film Studios, the Yellow Bike Project and the Lonestar Rollergirls would have sniffed them out by now. I'd love to know the ultimate origin of the Mueller concentration camp legend. I think I first heard it from John Stockwell around '84 or so. Might FEMA have once drawn up a list of potential emergency detention facilities that did include Mueller?